Its the first time that I’m actually making something with kids in mind. Mine are all grown up and now treat hubby and me like kids! Don’t do this, don’t travel alone, call us when you’re going out, etc etc. Does that sound familiar? Are we getting a dose of our own medicine? My daughter in this respect is just too over protective. Sometimes I feel good but sometimes get irritated when she thinks I can’t think for myself. However, when she automatically holds my hand when we’re crossing a very busy road, I feel so loved. When my sons ask me if I need anything, its such a comforting feeling. When my son in law calls me mum, I feel joyous and when my daughter in law gives me a tight hug I feel as though my happiness cannot be contained. 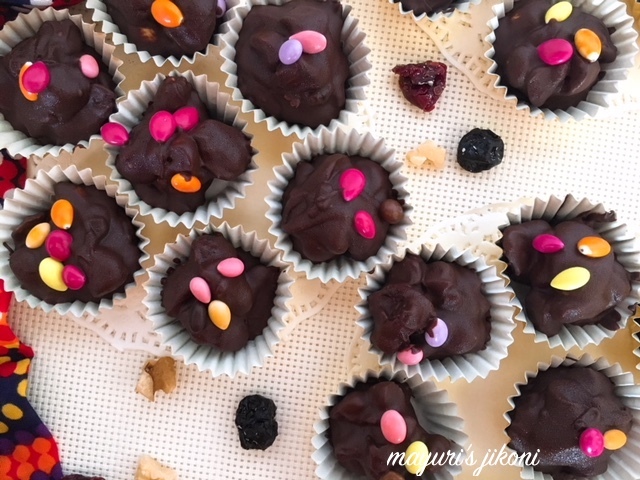 I made these nut and fruit clusters and shared it with my neighbors kids. The two year old who is not into anything sweet, refused to touch it. However, the rest enjoyed them. However, I was not allowed to take photos so have no proof. These clusters are so easy to make. I’m wondering why I’ve not made them till now. Hubby is always looking for chocolates with nuts in them. Whenever we buy a bar of Cadbury’s Whole nut, its difficult to find enough nuts in them. Same goes for the fruit and nut one that I love. So from now onwards, I think I’ll make these clusters at home so we can enjoy more fruit and nuts in our chocolates. These clusters are a a very convenient way to get kids to include nuts and fruits in their diet. Add nuts and fruits of your choice. I used almonds, cashew nuts and walnuts along with some dried blueberries and raisins. They make an ideal home made gift for anniversaries, Christmas, Diwali, Eid, for that matter for any occasion. Lightly roast the nuts in a pan if they are not crunchy. Cut big fruit into pieces e.g if you’re using strawberries. Line a tray with parchment paper or use small paper cups. Put the chocolate chips in a heatproof bowl. Melt the chocolate in the microwave oven or over some hot water. To melt it over some hot water, take a pan over which the bowl can sit in the pan without touching the bottom of the pan. (I find that some of the steel little pans most Indian kitchens have works well). Add some water to the pan and let it get hot over medium heat. Switch off the heat. Place the bowl with chocolate over it. Stir it with a spoon or spatula till it melts. Add vanilla or orange extract and mix well. Add the chopped nuts and fruits. Using a teaspoon, scoop up the chocolate mixture. With the help of another spoon, drop it into a cluster on the parchment paper or small paper cups. Let the clusters chill in the fridge. 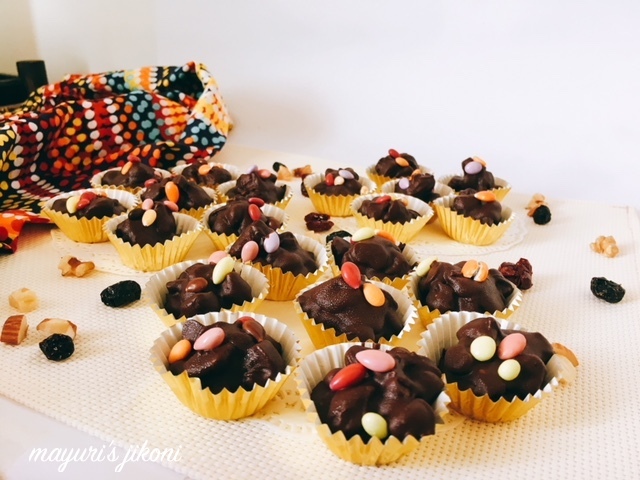 Serve these clusters as a treat to your children or add to their lunch boxes. If the chocolate does not melt properly then its probably very old. You may add only nuts. 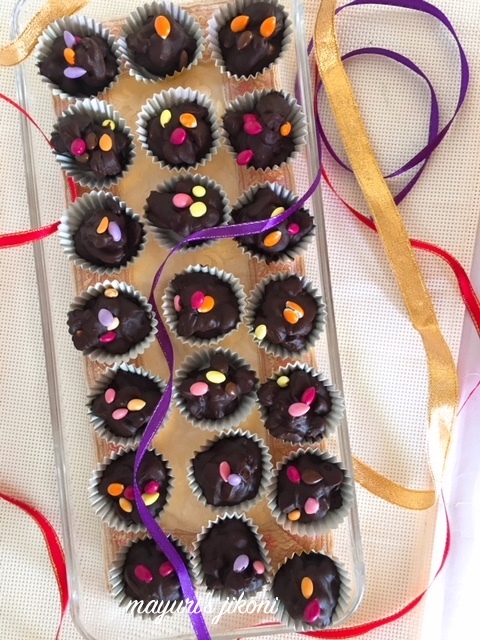 I find these clusters are a great party treat for both kids and adults. Very easy to make, get your kids to help you to make them. The number of clusters will depend on how big or small you make the clusters. Kids Delight event is initiated by Srivalli of Spicing Your Life. For BM #85th Kalyani of Sizzling Tastebuds is hosting the event. You said 3 ingredients..I am sold!! Such an easy and delicious treat for any occasions. This is definitely a treat for kids.. apt for the birthday parties. Am sure those clusters will definitely please anyone's tastebuds, such a fantastic chocolate treat, awesome Mayuri. A stunning treat for any occasion! Love the ingredients. I am sure kids loved it with all those nuts and dry fruits. Nice to read about your grownup children and the bond you share with them. My girls would definitely love these clusters as they love nuts. Super inviting and tasty treats. 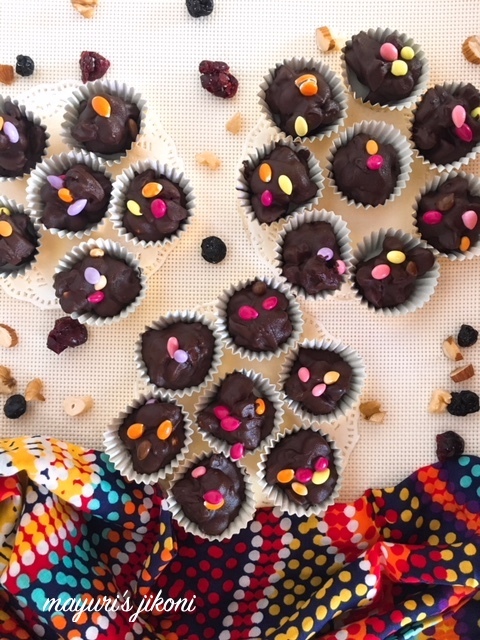 I make them whenever i have some leftover melted chocolate, another delicious way to already healthy nuts! love your presentation, never tried with fruits though, will make it next time!!! amazing, my kids will love these if I make them. You have many chocolate recipe. will check them for my BM posts for next week. What a simple yet delicious Chocolatey treat! Love it!